MARCOM's "Fire Prevention in Healthcare Facilities" Interactive CD-ROM Course looks at how fires in healthcare facilities start, and what can be done to prevent them... as well as what employees should do in case of a fire emergency. Among all the safety problems employees can encounter, fire can be the most frightening. Every year fires in healthcare facilities cause millions of dollars in damage and result in numerous employee injuries... and fatalities. Yet many employees do not realize how their own actions can contribute to the risk of fire. Areas covered in the course include common causes of fires in healthcare facilities, the concept of "flashpoint", preventing fires, fire extinguishers, handling flammable materials, evacuation and other employee responsibilities, first aid, and more. Using a powerful combination of audio, full-motion video, text and colorful graphics, this course provides the most cost-effective safety and regulatory compliance training available today. The course is divided into a number of logical sections so information is easily understood... and retained. 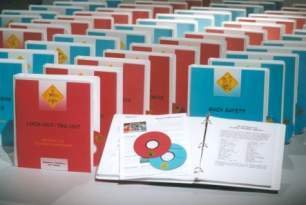 Also designed with the training manager in mind, all courses in the Interactive CD-ROM Training Library include a learning management system (at no additional cost). Using this system, trainers can set up "Pre" and "Post" tests... establish log-in procedures... even define and set up curriculum for various job classes. The system also collects and organizes employee performance information through a powerful relational database, which can generate a number of record-keeping and tracking reports... and has a database "import/export" feature, which allows information to be transferred to and from an external database (such as a company's personnel database). The course is one of over 100 titles currently available in the Interactive CD-ROM Training Library.